As many of you know, I am a big fan of libraries. I remember my mother introducing me to the public library before I was in school. She stood by a wall of books and waved her hand saying, “All of these are free.” I couldn’t believe how wonderful it was. I used the library extensively before I was published, borrowing YA books, books on writing. I would buy my favorites, but this gave me a chance to test out many of them, as well as audiobooks. 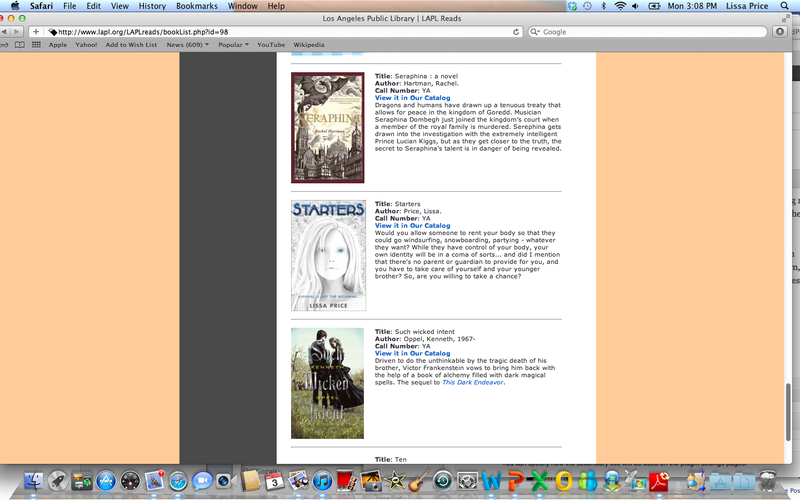 So making this Best of List from the Los Angeles Public Libraries, selected by librarians, really made me happy. I’m also happy to be there on the list with some of my friends. The wonderfully generous YA author Veronica Rossi (Under the Never Sky and the upcoming Through the Never Night), alerted me to this good news. When you follow the link, the titles are listed alphabetically. I believe Starters is one of only four debuts. If you haven’t read Starters yet, you can ask your local library if they will get it for you.